The petite 3.2-million-year-old skeleton called Lucy is one of the most famous and most complete of human ancestors. But she was found without her foot bones, so researchers have debated whether she walked as we do or retained some apelike adaptations for climbing in trees that altered her gait. Now, a 3.2-million-year-old foot bone from a member of Lucy's species, Australopithecus afarensis, reveals that this hominin was no flat foot: It had already evolved arches and a stiff midfoot similar to living humans. That means if Lucy were alive today, she could fit in high heels or march for miles without breaking her feet. "This discovery puts the spring back into afarensis's step," says co-author Donald Johanson of the Institute of Human Origins at Arizona State University (ASU), Tempe. Fancy footwork. A bone in the mid-foot of Lucy's species reveals that it had an arch. When Johanson and his colleagues discovered Lucy's partial skeleton in 1974, it showed that she walked upright, confirming that our ancestors did so before their brains started getting larger. But did she walk upright most of the time like a modern human or still spend plenty of time in the trees evading predators? Mysterious footprints left at Laetoli in Tanzania show that a hominin of this time, 3.7 million years ago, did indeed have arches in its feet. But researchers couldn't be sure who left those prints, because it wasn't clear whether A. afarensis had an arch, says co-author William Kimbel, a paleoanthropologist at ASU. Now, researchers think they've solved the mystery of Lucy's footwork, thanks to an analysis of about 35 new individuals of A. afarensis uncovered at Hadar, Ethiopia, in the past 15 years. The key is the fourth metatarsal, a long bone that connects the toe to the rest of the foot. The way the two ends of the bone were twisted in relation to each other in the fossils suggests that when one end was on the ground, the other end was raised about 8˚ to attach to the rest of the foot, says lead author Carol Ward, a paleoanthropologist at the University of Missouri, Columbia, in a study reported online today in Science. This torsion is found in feet with well-formed arches, which are stiff enough to use the foot like a lever to push off the ground but flexible enough to also work like shock absorbers. 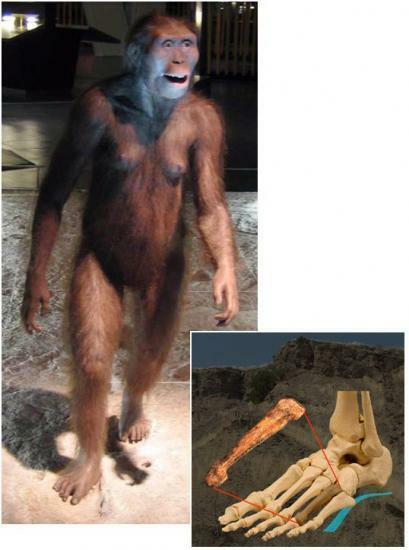 The bone also shows that A. afarensis had abandoned the flexible midfoot that apes use to grasp tree branches, in favor of an arch that makes upright walking more efficient. "This tells you that climbing in the trees was not nearly as important as walking on the ground," says Ward. Paleoanthropologist Will Harcourt-Smith of the American Museum of Natural History in New York City isn't willing to go that far. Although he agrees that A. afarensis had some arching, it may have lacked the most important arching on the inside of the foot. Lucy's fingers and toes also were more curved than those of living humans and her shoulder was more apelike—traits useful for tree-climbing. "It's hard to envisage an animal that had entirely made the leap to full, obligate bipedalism," he says. But paleoanthropologist Jeremy DeSilva of Boston University says that the new foot bone, along with a "laundry list of other features of the lower limb" make it more likely that A. afarensis was a "terrestrial biped with little time spent in the trees." It also suggests that it was indeed A. afarensis that walked in the mud at Laetoli. "Finally," says paleoanthropologist Bruce Latimer of Case Western Reserve University in Cleveland, Ohio, "we can put the mystery hominid at Laetoli to rest."